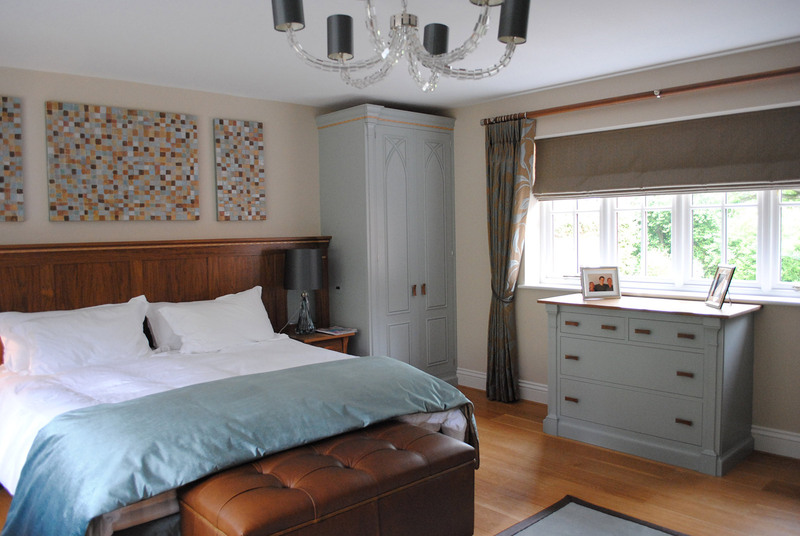 This was a complete redesign to work in with the new Mark Wilkkinson furniture that was being fitted in the room; the client wanted a relaxing and calm, but luxurious feel to the bedroom. I used a mix of textured and patterned silks to bring relief to the windows and selected walnut curtain poles to echo the walnut headboard. Other textured were then introduced in the leather on the bespoke ottoman and silky rug bound with leather. The beautiful glass chandelier and bedside lamps are from the London based company Porta Romana, and the artwork produced specifically to bring together the colours in the room is by Crowborough based artist Liesha Yazicilar.